NEW ORLEANS – The dawn of the New Year brings about the preseason indoor edition of national track & field team rankings for NCAA’s Division I. Ranked by the U.S. Track & Field and Cross Country Coaches Association (USTFCCCA), the men of Florida State have been identified as the No. 1 team in the land entering the season with in-state rival Florida at No. 2 close behind. On the women’s side, Texas A&M, the defending outdoor champion and led by a talented sprint crew, enters the season No. 1 in the rankings. The first regular release of updated rankings for NCAA’s Division I will start on Tuesday, January 26, with updates occurring the following seven Tuesdays leading to the NCAA Indoor Championships, March 12-13. In addition, the 2010 preseason watch list for The Bowerman will be announced next Tuesday, January 12. An early look at the men’s team race to March’s NCAA Indoor Championships in Fayetteville, Ark., has the Seminoles of Florida State atop the standings with 132.21 points with No. 2 Florida on their heels at 128.49. No. 3 Oregon, the defending indoor champions, along with No. 4 Nebraska is clearly within striking distance scoring 125.63 and 120.76, respectively, in the initial rankings. Florida State returns sprinter Charles Clark for a senior season and junior heptathlete Gonzalo Barroilhet, both of which took runner-up honors in the 200 meters and heptathlon, respectively, at last year’s NCAA Indoor Championships, leading the Seminoles to a third-place showing. Florida State’s 4×400-meter relay compiled the fastest time during the indoor collegiate season in 2009 with a 3:05.97 clocking and finished second at the national championships. Ngonidzashe Makusha returns for his junior season having recorded the nation’s best long jump a year ago with a 26 foot, 11¼ inch (8.21m) leap at the ACC Championships. In addition, junior Matt Leeder returns after a sixth-place national finish at 3000 meters. Florida returns defending triple jump champ Christian Taylor for his sophomore season. Last year, as a freshman, Taylor took the national title with a collegiate season best leap of 55-8½ (16.98m) on his final attempt to dethrone then-freshman Will Claye of Oklahoma’s nation-leading attempt of 55-1½ (16.80m) taken just seconds before Taylor’s final salvo. Florida’s score also relies heavily on sprinter Terrell Wilks and his 6.59 season best in the 60 from a year ago. Florida also returns national scorers from a year ago Kernal Mesic (shot put, fifth) and Calvin Smith (400 meters, sixth). The Gators’ score does not include performances by sprinter/running back Jeff Demps as he sat out the 2009 indoor season. Defending national champions Oregon sits third on the national rankings, as they return quite a squad from a group who scored 54 points a year ago at the national meet. Despite the loss due to graduation of inaugural Bowerman winner Galen Rupp, who scored 22½ of those Duck points, Oregon returns 2009 Bowerman finalist Ashton Eaton who claimed an individual title in the heptathlon a year ago and has claim to a career best of 6,174 in the event. Eaton also contributes to his team’s score with nationally-prominent marks in the 60-meter hurdles and long jump. Senior Andrew Wheating was scored with the best-returning 800 meter time from a year ago (1:48.54) and as a potential dark horse in the Mile. While the Ducks also won the distance medley relay national title a year ago with Rupp, a large group of distance stars including Matthew Centrowitz, Andrew Acosta, Luke Puskedra, Scott Wall, and Diego and Daniel Mercado have spots in the national scene. Nebraska is ranked fourth led by a bevy of field-event athletes. Arkansas rounds out the top five and returns senior mid-distance star Dorian Ulrey. The top ten includes No. 6 Oklahoma, No. 7 Arizona State, No. 8 Texas A&M, No. 9 LSU, and No. 10 Minnesota. The Big 12 Conference has eight schools represented in the national preseason top 25, adding No. 11 Baylor, No. 14 Texas Tech, No. 21 Oklahoma State, No. 22 Kansas State, and No. 25 Kansas. The Southeastern Conference was next with seven members represented. The preseason rankings for the women have Texas A&M (185.08) with a commanding lead over No. 2 Oregon (131.82) and No. 3 LSU (120.74) to enter the season. 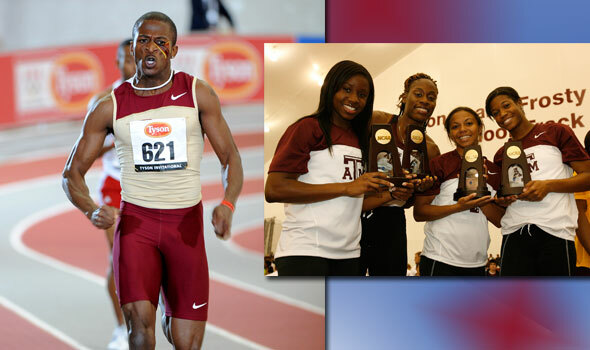 The Aggies, who placed second at last year’s indoor championship, will return a plethora of sprinters and jumpers who have an immense impact on their respective events. The group of sprinters includes 2009 Bowerman finalist Porscha Lucas, Gabby Mayo, Jessica Beard, Khrystal Carter, and transfer Jeneba Tarmoh. The Aggies won a national indoor crown in the 4×400-meter relay last season, adding a second-place showing by Lucas in the 200 and a runner-up performance by Beard in the 400. No. 2 Oregon has depth in distance events and pentathlete Brianne Theisen returning for her sophomore season. Theisen recorded the second-best season best (4,321) among the nation’s returners a year ago. Alex Kosinksi, Nicole Blood, and Mattie Bridgmon are among a distance contingent that will have an impact on the Mile, 3000-, and 5000-meter events. Also returning, junior Jamesha Youngblood was fifth nationally in the long jump last season, senior Keisha Baker was sixth at 400 meters, and junior Melissa Gergel was seventh in the pole vault. LSU at No. 3 returns double sprint threats Samantha Henry and Kenyanna Wilson as contenders in the 60 and 200. Sophomore LaTavia Thomas took third at the NCAA Indoor Championship last season at 800 meters and junior Brittani Carter was third in the high jump. Pole vaulter Rachel Laurent was fifth at the national meet last year, marking another Tiger underclassman to watch this season. Florida State is ranked fourth behind double jump threat Kim Williams and hurdler Teona Rodgers. BYU is ranked fifth and returns defending national champ pentathlete Amy Menlove and the defending national champ at 800 meters, sophomore Lacey Cramer. The remainder of the top 10 includes No. 6 Florida, No. 7 South Carolina, No. 8 Washington, No. 9 Clemson, and No. 10 Penn State. The Big 12 and SEC shared five teams apiece in the national top 25. Rankings for the preseason release derive mostly from data accumulated in the previous indoor season and include marks from athletes eligible for their teams for the 2010 indoor campaign. Other information was reported to and compiled by the USTFCCCA, including transfers and returning athletes that “redshirted” the previous year. Marks achieved during the December portion of the 2010 season are also considered. Mathematical formulae are used to compile a team’s ranking based on an athlete’s or relay’s standing in relation to others in the same event across the country. In the 2009 indoor and outdoor seasons, the preseason rankings identified three of four eventual champions (Oregon men-indoor, Texas A&M women-outdoor, Texas A&M men-outdoor). Of those placed in the top five during the preseason, 75% went on to finish in the top 8 and 85% went on to finish in the top 10 at nationals. Of those ranked in the top 10 during the preseason, 70% finished in the top 10, 83% in the top 15, and 90% in the top 20.